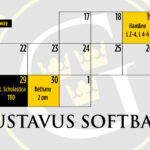 The Gustavus softball team will close out the 2019 season with three doubleheaders in consecutive days. The Gustavus baseball team Wednesday earned its second walk-off victory in the past week, beating St. Thomas 7-6 in 11 innings for its seventh consecutive win. The game picked up in the top of the 11th after being suspended due to darkness on April 16. The Drake Alternative, hosted by the Gustavus track & field team, has been moved up from Saturday to Friday due to expected rainstorms on Saturday. The meet schedule will be posted after entries are submitted later tonight. 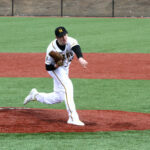 Dominant pitching headlined Tuesday’s doubleheader at CHS Field as the Gustavus baseball team blanked Hamline 3-0 in both games for its third consecutive MIAC sweep. 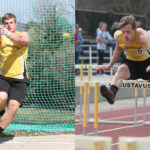 The Minnesota Intercollegiate Athletic Conference announced its Men’s Track & Field Athletes of the Week on Tuesday and Gustavus earned a couple honors. Taylor Rooney (So., Andover, Minn.) was named Track Athlete of the Week and Michael Hensch (Sr., North Branch, Minn.) was selected as the Field Athlete of the Week. 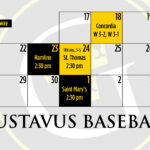 The Gustavus baseball team is in action twice throughout the weekdays as it travels to Hamline for a pair of contests Tuesday with the first game beginning at 4 p.m. before hosting St. Thomas on Wednesday for the conclusion of game two from the contest on April 16. 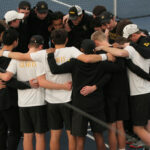 The Gusties enter the games 16-9 overall and 7-4 in the MIAC.